I am growing vegetables this summer. For the third year in a row I’m attempting to grow something in my two squares of garden. Last year the summer in Alsace was some kind of fierce, cold, rainy and windy, so we didn’t achieved much. This year is looking promising and after easter we will begin the different crops. I use the technique explained in Square foot gardening à la française: the potager en carrés. It’s handy, simple to follow, plant and maintain and it gives good results even to inexperienced like me. You need to know your friend and their friends, were you are the only human and the rest of the friends, your or theirs, are vegetables 😉 You need to know who’s happy near who and who’s unhappy near who, so you can proceed planning all your squares. You need to know how much space each crop will take: courgette are HUGE on the other hand carrots ot shallots are happy in small spaces. You need to be ready to fight against the voracious snails, and for that you need a deep container, beer and sugar: they love beer and snails will drown in it. Remember before thinking “oh poor snails”: it’s them or your crops! They can eat a broccoli head overnight! 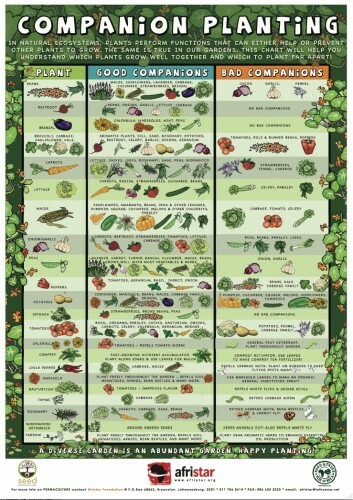 For the vegetable friendship I’ve found a nice and interesting chat that can help you. And for more interesting garden related stuff you can check out my board on Pinterest: Garden.